Baseball Season Opens: Of Mud Hens & More… | Paul's Voyage of Discovery & Etc. Baseball is back. Which means that, for some of us, the suffering has just begun. But despite the travails and triumphs of the teams we follow with such passion each season, the classic American game that legend has attributed to Abner Doubleday — played with a bat and ball — is fundamentally a profound and simple joy. My hometown Cleveland Indians opened this 2010 baseball season on April 5th in Chicago by scratching out just four hits in a 6-0 loss to the White Sox. An ill omen, to be sure. Three days later, 250 miles east on Interstate 80, it will be Opening Day for the Toledo Mud Hens. But for the vast majority of those who follow baseball, the Toledo Mud Hens are a minor league baseball team that plays in the International League. The current Mud Hens are the latest of a series of pro ballclubs that have called Toledo home since 1883. 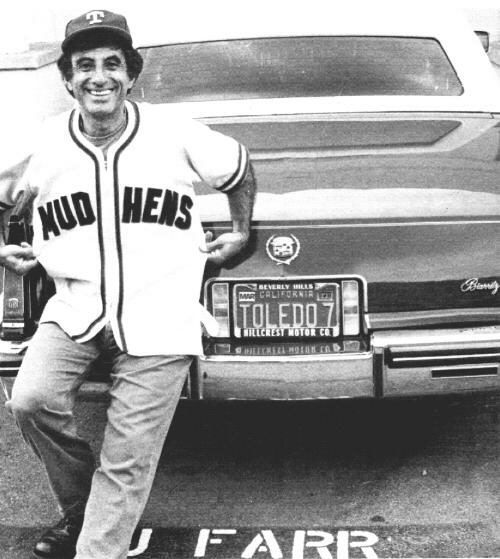 For many years, "M*A*S*H" star, Jamie Farr, was the Toledo Mud Hens most high-profile fan -- other than Wolf Larson, of course. The name “Mud Hens” was bestowed upon the team in 1896, as one of the two parks they played in that year was located near marshland inhabited by American Coots, also known as marsh hens or mud hens. Another Cleveland connection to The Mud Hens is even more surprising. When the team was playing in Cleveland, it took on a new nickname: the “Iron Men”. The nickname of my high school alma mater, Cleveland Central Catholic, is “The Ironmen”. This is the kind of information baseball fans love to exchange in the long pauses between pitches, between innings, and between hot dogs and beer. The Mud Hens may be a minor league team, but they’ve had a lot of major league talent over the years – and some legendary ballplayers have worn Mud Hens gear, including Addie Joss, Travis Fryman, Kirby Puckett, Casey Stengel, Jim Thorpe (yes, that Jim Thorpe), Frank Viola, and the great, drunken Chicago Cub’s slugger, Hack Wilson, who knocked in 191 RBI’s for the Cubbies in 1930 – a major league record that still stands. 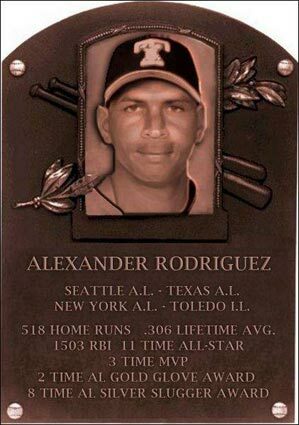 Click here for a complete list of Toledo Mud Hens alumni enshrined in the Baseball Hall of Fame. It should also be noted that Toledo is the site of a failed late 19th Century attempt to break pro baseball’s color line. The 1884 Toledo Blue Stockings of the American Association, was the only major league team with black players (Moses Fleetwood Walker and his brother, Welday Walker) before Jackie Robinson and the Brooklyn Dodgers made history in 1947. Sadly, Cap Anson, the racist star of the Chicago White Stockings (alas, the modern day Cubs) refused to play on the same field as a black man. Though Anson relented when told his team would lose its share of the gate for an exhibition game against Toledo – Anson’s steadfast resistance to interracial play helped to draw an ignominious color line in baseball for another 63 years. Now, back to 16” softball. 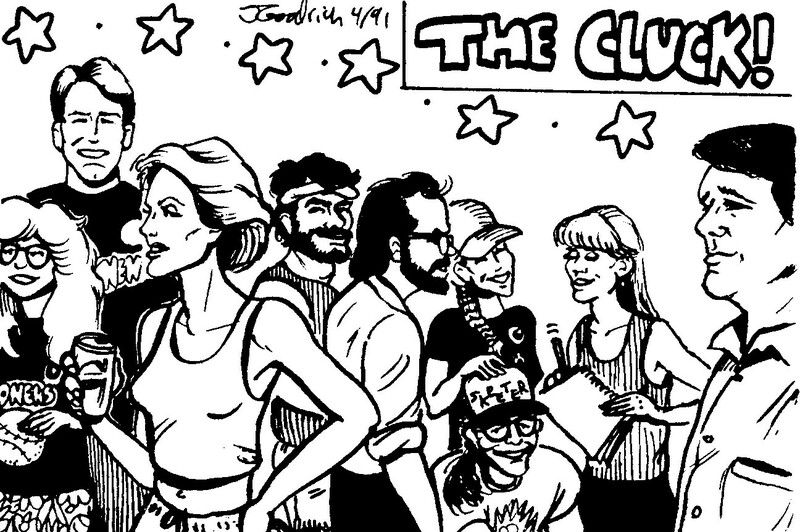 Most of what you need to know about this wacky, egalitarian, and blessedly coed sport is encapsulated in this graphic from the website of the Chicago 16” Softball Hall of Fame. 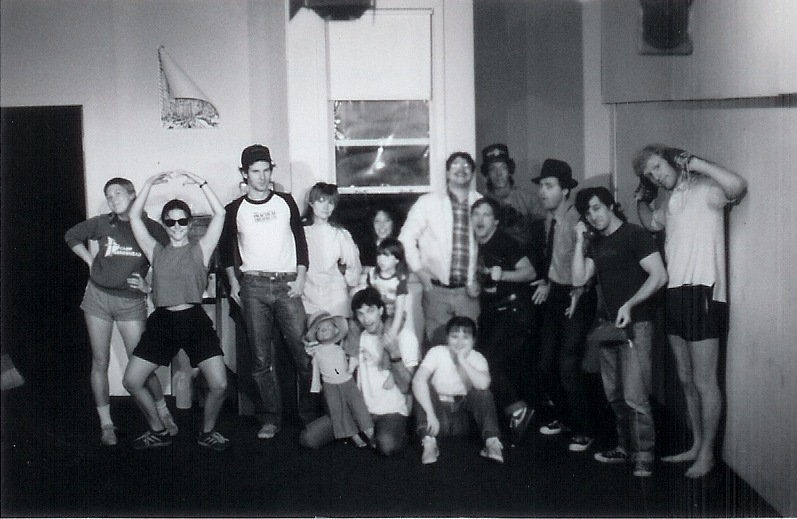 Toledo Mud Hens on the stage of the PTC's John Lennon Auditorium (1983). 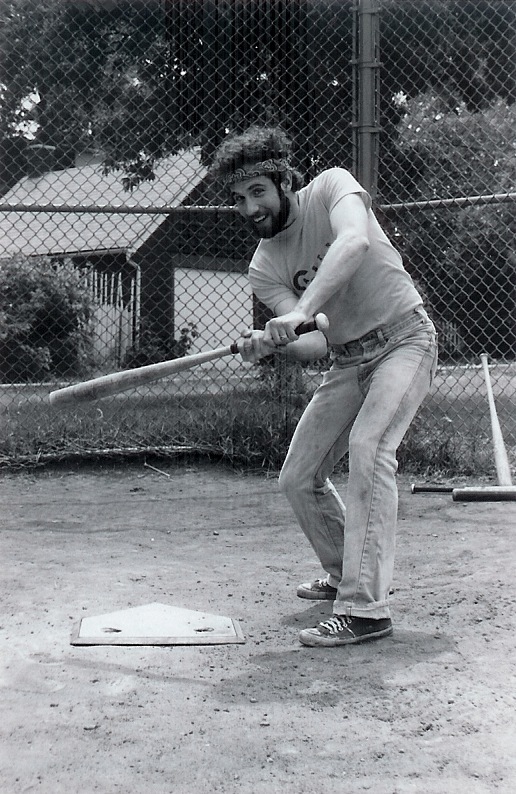 These photos, taken in 1983, capture the distinctive batting stances of the early PTC Toledo Mud Hens. What we lacked in skill, we made up for in style. Of course, not all Mud Hens were without skill. Coach Wolf consistently crushed the ball at the plate and caught everything in centerfield within reach – and many that were far out of reach. Terry Barron was a real honest-to-goodness shortstop that could field and throw with dexterity and flair. I witnessed Terry’s heroics many times from my post at third base. How good was I? Well, I still have a bent ring finger on my left hand from where I mishandled yet another bouncing, bounding 16” projectile. Over the years, players came and went – but Coach Wolf continued to hold the team together with the help of player-manager Ken Snedegar, and a new cast of Mud Hens clucked together into the early 1990’s. This edition of The Mud Hens was a winner. Heck! They even won league championships! 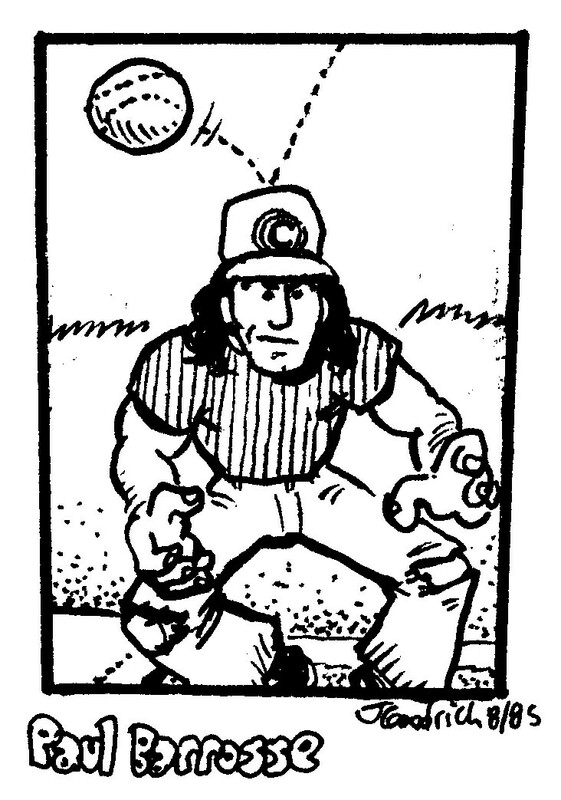 And they had baseball cards, drawn by John Goodrich. Here’s a select batch of some of Johnny B’s favorite Mud Hens cards from the six sets that he and Ken Snedegar produced. John tells me that many Mud Hen veterans have chosen the Paul Barrosse card from the first set (1985) as their favorite Mud Hen card portrayal of all time. It certainly captures my proficiency in the field. 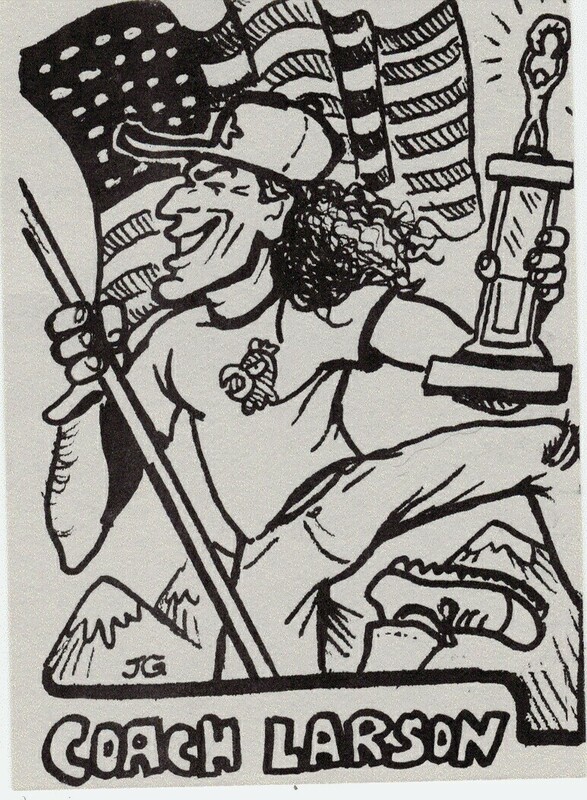 For John, half the fun of the cards was the meticulous stats and “fun facts” on the backs, supplied by Captain Snedegar. You can see by the reading the back of Barb Reeder’s card in ’90 how far John and Sned progressed in their card-making, stat-tabulating craft. Today, Coach Wolf is living in faraway Madrid, Spain – where I presume they have no 16” softball. Yet I know that, even in Spain, Wolf Larson is well aware that it’s baseball’s opening week – and that The Toledo Mud Hens will take the field to start the 2010 season this Thursday. As for the Chicago Theatre League’s Toledo Mud Hens – they played in the league championship final on August 31, 2009. Does anyone know who won? Do we still know any Mud Hens on that team? 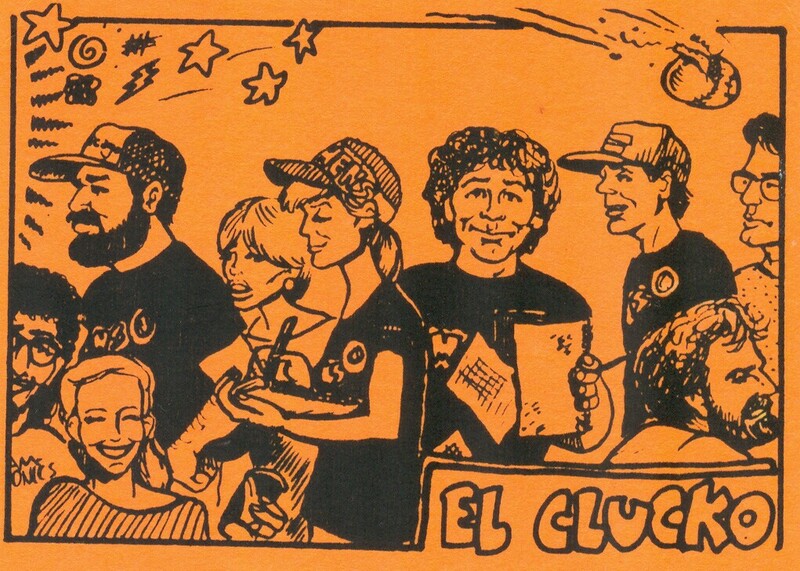 Let’s hear you cluck, Mud Hens! 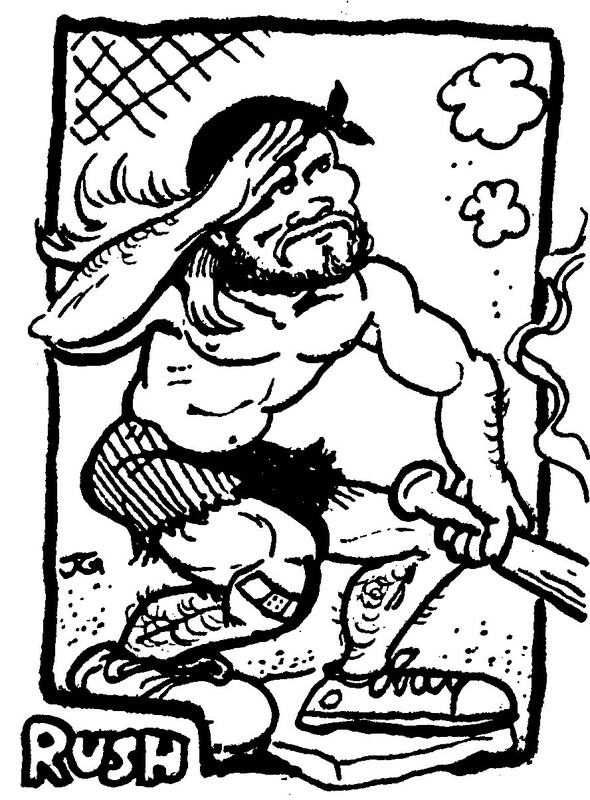 Now, here’s a gallery of classic Chicago Theatre League Toledo Mud Hens Cards, drawn by Johnny B. Goodrich. A similar tale can be told about the mighty, mighty Harisse Davidson Rookie Feenoms led by Terry Bozeman, and mostly populated by Goodman School Grads and their fellow-travelers. When we geezers are together, we speak of those summers as “When Life Was a Beer Commercial” and have another sip of decaf. Hey, Malcolm! Nice to hear from you. I remember your team very well. Terry was another one of those guys who could really play. Some of us were much better at drinking beer. At where else but in 16″ softball is beer standard equipment? Great stuff as usual Paul. Captain Sned is still helming the Mud Hens, and if I recall correctly, they recently added a 2nd title. John’s cards are truly genius, Kate Tabor has posted several years worth on her Facebook page. The great thing about your card is not just that it captures your prowess in the field, but the way it captures your essence, which is why John’s cards are so genius, he managed to do that for everyone. Good luck to your Indians this year, may they meet my Yanks in the playoffs, so we can have another food bet! Wow – how embarrassing. Photographic evidence of my mullet, bestowed upon me one very stoned evening at Homer Practical by Angela. Didn’t last long – I cut off the back soon after & just had short hair, but there it is, in black & white. I also remember our PTC biz cards had our Mud Hens position on them rather than “literary manager” or something dull like that. So sorry I missed the Johnny B Goodrich player card days, but I was already in NYC, playing in Jake Daehler’s epic Sunday pickup game in Central Park by then. Alas, Sally. Your mullet was no worse than my own. 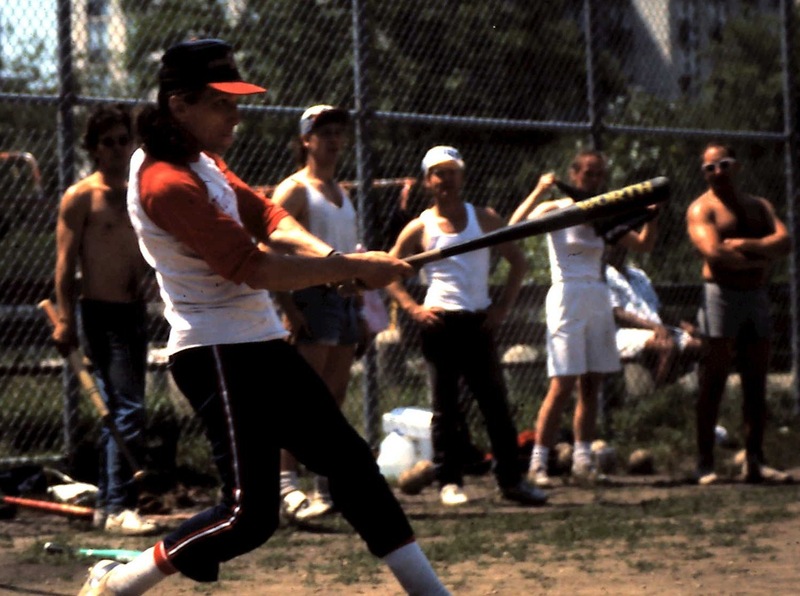 I started my career as the panicked fourth woman on the field in 1980 for Northlight Theater. We practiced up at Fitzsimmons Park next to the Noyes Cultural Arts Center (a place I now spend lots of time as my girls are lifers at the Actors Gym). The Mudhens cards were so damn fun to do. Dug ’em out of storage for the first time in decades not long ago and was tickled by what a kick my daughter got out of them. Someday I’m gonna post every dadgum card, front and back, on my website or something. The backs were over half the fun. 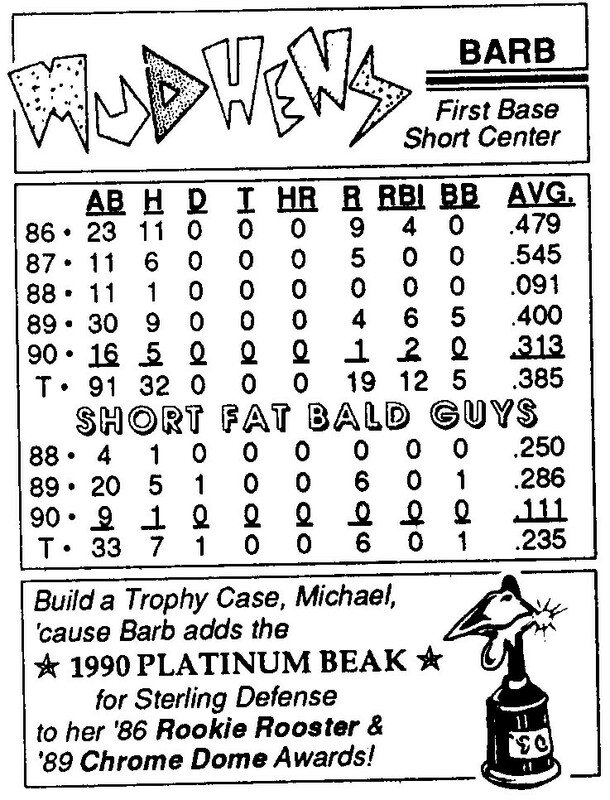 BUT let’s not forget to also salute the Mudhens spin-off team, started by Beefma Kalicky and Al Leinonen, The Short Fat Bald Guys — ostensibly existing to give Mudhens second-stringers a chance to play more. I severely dislocated one ring finger per team (a specific injury almost entirely indigenous to summertime Chicago, a sports-ortho guy in MA once told me). GOOD TIMES. Oh, is this a wonderful column, Paul! Jules will be particularly happy to see photographic evidence of what I think we can assume is a solid three bagger. 16 inch softball is such a wonderful form of the greatest game ever given by God directly to Her people. Those who’ve never lived in Chicago simply don’t understand that baseball without leather still smells and tastes like baseball. And to see John’s perfectly perfect cards again is a treat beyond treats. I certainly concur that yours is the best card — and add that Casey’s determined grimmace in the photo card is priceless. 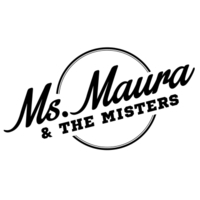 It will soon be time for the Mudhens fiftieth reunion. Warm up those rotator cuffs, boys and girls. And nice Mullet, Sal. Thanks Brad. It most definitely qualified as a “hair don’t”, but hey – it was the 80’s. Bad hair ruled. Paul — you need to be writing about Tyler Colvin. Did you see the laser beam he hit in his first at bat last night in Atlanta? Hasn’t Lou been moaning about how the Cubs are not left handed enough? He made a nice play in the outfield late in the game, too. How much is left on Soriano’s contract, 60, 70 million? God help us. Cubs fans and Cleveland Indians fans. A brotherhood of suffering. 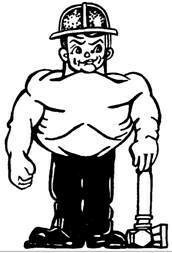 At least I have the jealous/vindictive pleasure of knowing that Cliff Lee is out for a month. But watching guys like Lee and Sabbathia pitching for other teams is heartbreaking. I wouldn’t really know what it’s like to be paying a fading star too much — because Cleveland NEVER keeps its stars. Thanks for using the more flattering of those Goodrich cards for me. Whew, that was close. I dug the bat mask. By the way, nice Daisy Duke shorts, Brad. And Paul you’re wrong about Cleveland never holding onto their stars. Did they not keep Max Alvis on their roster until he was done? Maybe not a Hall of Famer, but the biggest wad of chew bulging out his cheek in the entire run of 1969 Topps baseball cards made him a star in my book.